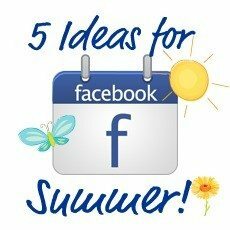 5 blog and Facebook page posts just in time for summer! I’ve been brainstorming some fresh ideas for real estate social media campaigns — you know, the ones that aren’t about listings, or real estate, but the ones that residents in your community might find helpful. These are ideas either for a real estate Facebook business page or even your blog. Having a busy family myself, and with the school year coming to an end, my mind always shifts to the things that we will be doing this summer — or should be doing. So while I was jotting some ideas down, I thought I would share what I’ve come up with so far. You may be able to use them, or they might inspire some fresh new ideas, too. Feel free to add to the list of what has worked for you. Check back for more, too. I’m sure I’ll be adding to the list. Publish or link to your city’s Parks and Recreation Summer Activity Guide. Most city websites have a community page where they link to downloadable PDF copies of summer activities, camps and other recreation for the summer. Since most classes have an enrollment, it’s helpful to share this online so your readers can download the info directly from your website and not miss important enrollment deadlines! High school reunions: Publish any information on any that might be happening. Alumni prepare a whole year for their high school reunions! If you can give them some notice on when and where they will be happening, you are sure to gain some new fans! Video interview a local teacher from a school in your community for some great summer education ideas for kids of all ages — you know, ALL those ideas and fliers you get from teachers when school lets out to make sure our kids’ minds are kept busy during the summer? Why not highlight a teacher in your community and do a fun interview about those ideas, and on how she plans to spend HER summer? What a great way for the kids in the community to get a glimpse of their teacher on camera! Stage your home — just for fun! Create a video with your favorite home stager on how to “create the look” of a staged home. Do you work with a home stager from time to time or perhaps with all your listings? Share some of that great secret sauce with your readers and give them some staging tips. Not only will this be a fun project for the summer for some residents, but perhaps it will entice those same people to come to your open houses. Link or write a post, or video your local farmers market if you have one. Or perhaps your community has Movies in the Park or any kind of seasonal event that’s fun for the whole community? Let your readers know all about it, and have a photo contest for the best photo from the event. If you have some more ideas that you’d like to share, I would love to hear them!